Healthy Cake Pops recipe - a healthy treat for kids! Healthy Cake Pops are the perfect compromise – a treat your kids will absolutely adore, but without the junk. 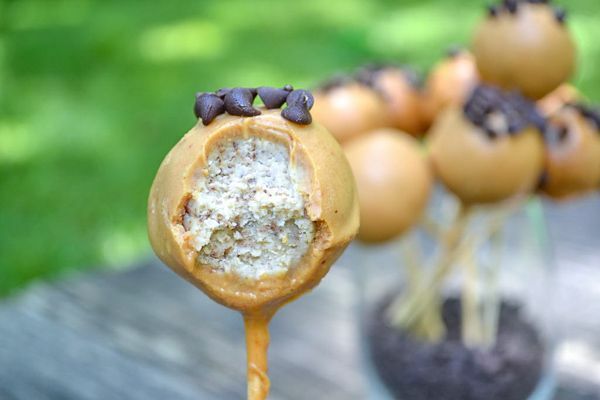 Take your kids favorite treat on a stick and put a healthy, breakfast twist on it with this sugar free cake pop recipe. With no refined sugar, healthy fats, and a secret ingredient, you’ll love serving these easy treats without the guilt. This quick and healthy breakfast for kids can be made nut free and gluten free, uses leftover pancakes (shh!) and ingredients you probably already have around the house. This post was originally posted on July 18, 2017 and has since been updated. Last week we went to Starbucks as a family and while sitting in the drive through waiting to place our order, Ryan started screaming for an “ARR POP!” and my eyes got reeeeeeeaaaal wide. On Ryan’s birthday in May, I got him one of those seasonal Pirate Cake Pops and he was immediately in love. I had bought him 2 since, both after doctor’s appointments, and I may have bred an addiction. So much so that Alex asked me what on earth I was feeding him when he wasn’t around. My entire reason for never getting him that kind of stuff at Starbucks for the first 3 years of his life was because I didn’t want it to be a ‘thing’ every time we went to get coffee. So, I quickly went into research mode to find healthy cake pops that I could give him without essentially giving him sugar on a stick and I found… nothing. Okay, that’s not true. I found date balls on a stick, which while tasty, was not what I wanted and definitely not what Ryan wanted. There were also cake pops made in those weird cake pop machines. But to be honest, I do not have space in my house to buy a machine that I’ll use once and then probably never again. (I mean, let’s be honest, people.) So I needed to think of a different way to enjoy a healthy cake pop. The Key to a sugar free cake pop..
And then, my lovely, lovely husband came to the rescue. One day while talking about the stupid Arr Pops, Alex said I should make some kind of healthy breakfast version to find our healthy cake pop solution. He was half joking, half serious, suggesting mushed up bread on a stick, and while I rolled my eyes, it did get my wheels turning. Because really, it wasn’t a bad idea. Okay, mushed up bread on a stick is a bad idea, but healthy cake pops based in breakfast food? Not a bad idea. Enter: leftover pancakes. If you’re looking for cake, this collection of healthy cake recipes is for you! So I did a bit of experimenting and came up with these healthy cake pops. The base? My favorite pancakes. You could also play around though and switch the flavor. I love these apple cinnamon pancakes and these healthy cinnamon ricotta pancakes. The pancakes allow for you to create the texture of a ‘traditional’ cake pop without using actual cake. This way we can manipulate our “base” to be protein packed, whole wheat, gluten free, sugar free – whatever you want, really. While pancakes aren’t exactly quinoa, they can be quite a bit healthier than actual cake. This way, you can control the sugar component more. Making these sugar free treats is super simple and would be a fun way to get littles in the kitchen with you! Here’s how to make your own. Pulse 12 leftover, cooled pancakes in your food processor or high-speed blender until you have a container of fine crumbs. I used a regular pancake recipe here. Just double your normal pancake recipe and save half. The pancakes I used were made with 1/4 cup of batter for each pancake. I always make 2-3x pancake recipes so I can freeze extras to use later. Substitute the sugar for maple syrup or honey to cut down on refined sugar in your favorite recipe. Next, whip up your brick of cream cheese, maple syrup, and vanilla until light and fluffy. Taste the mixture to see if you’d like more maple syrup. Combine your crumbled pancakes and the cream cheese mixture well. Use your hands and just mush everything together. Add in some mini chocolate chips if you please (I always do) – about 1 handful went into my batch. Scoop out the dough into balls – I used a 1 tablespoon cookie scoop because it’s my favorite kitchen tool. Press your dough firmly to make sure they are nice and tight before your refrigerate them. Next, you’re going to work on the coating. Normally, cake pops are coated in a thick shell of candy coating or melted chocolate. All fine and dandy unless you’re trying to make one that’s a bit healthier. I should make a note before I go any further. If you’re looking for something that travels well, you might want to stick to a thin coating of chocolate. This coating melts at room temp due to the coconut oil. But if you’re okay with that, keep reading. Melt 1/4 cup of coconut oil and mix with 1 cup of peanut butter and 2 tablespoons of honey. You can use maple syrup for continuity sake. I find it gives a bit of a different texture. Still delicious though and works just as well. When combined well with no lumps, pour into a container that is a bit taller. I actually put mine back into the empty PB jar. That way you have more room for dipping without having to spoon the coating onto the cake pops. Dip your cake pops into the mixture and tap firmly to get off the excess. The coating should be cooled enough to firm up almost instantly to the chilled cake pop. This way you don’t have a ton dripping down the stick. If you find this to be an issue, return the cake pops to the freezer and cool down the peanut butter mixture. If you want cake pops with no lip on top, you’ll have to set them stick down. I poked holes into cardboard to make my set up. Sprinkle with mini chips or sprinkles if desired while your coating is still slightly wet. 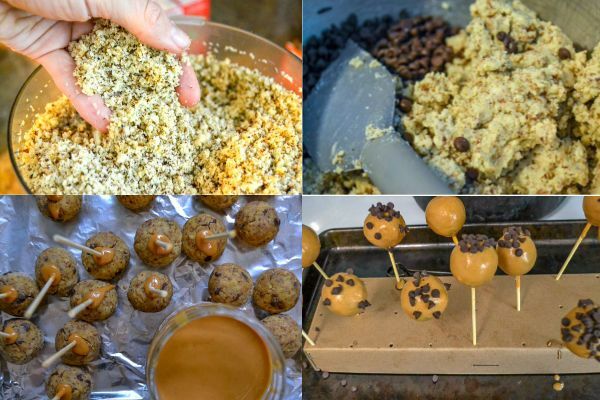 Alternatively, place about a tablespoon of chips onto wax paper and place your healthy cake pops on top. And that’s it, my friends! You can either eat your healthy cake pops within about a week or freeze them – this makes about 36 so freezing some isn’t a bad idea. If you freeze, just allow thawing a bit before enjoying. Use leftover pancakes. Double your normal, favorite pancake recipe and put half into the fridge. You can use any kind of nut butter or seed butter to these to make the allergy friendly. Gluten-free pancakes would also work with this recipe. The coating will need a second layer if it’s too thin. If you think your coating is too thin, allow it to cool a bit more to thicken up. You can also place the pops into the freezer for 5 minutes between double dipping. I like using a 1 TBS cookie scoop when making these to that they are uniform. If you’re having issues getting the cake balls to stay on the stick, dip them in the coating before putting into the cake pop. Then, return to the freezer to cool for 5 minutes or so. Want to get the kids involved? This is a fun recipe to get your kid to help with since it’s a “safe” recipe with no heat for the most part. My boys love pulsing the food processor after I add the pancakes and lock the lid. Dipping and decorating is always a kid favorite. But let’s be honest – kids will LOVE squishing the pancakes and ‘frosting’ together most of all. It’s also a great opportunity to remind littles about kitchen rules and hand washing! 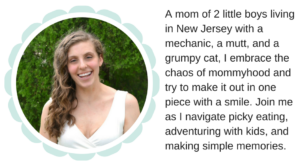 Thanks so much for being a part of Morgan Manages Mommyhood! I use my food processor to speed up so much in my kitchen. But in this case, it really makes grinding the pancakes in this recipe so much easier. We got this 8-cup Cuisinart after our old one finally died after over 10 years, so I can’t recommend it enough! 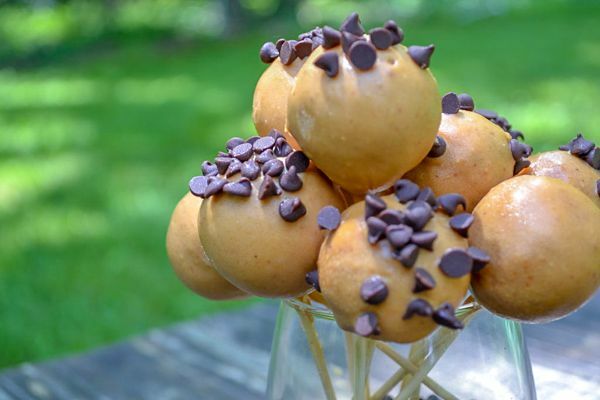 These sugar-free cake pops are the perfect balance of fun and healthy. They would even make a fun breakfast on the go! Make it nut free by subbing in sunflower seed butter, or gluten-free by using GF pancakes. Either way, your kids will love this healthy alternative to a coffee shop favorite! Love this recipe? Rate it 5 stars – ratings mean more people will get the chance to try them out! Healthy Cake Pops are the perfect compromise – a treat your kids will absolutely adore, but without the junk. 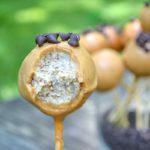 Take your kids favorite treat on a stick and put a healthy, breakfast twist on it with this Healthy Cake Pop recipe with no refined sugar, healthy fats, and a secret ingredient. Pulse the pancakes in a blender or food processor until fine crumbs. Whip cream cheese, maple syrup, and vanilla until light and fluffy. Combine the pancake crumbs and cream cheese mixture well. Add about .5 cup of chocolate chips if desired. Scoop into balls (I used a 1 TBS cookie scoop) and refrigerate. Stir together melted coconut oil, nut butter (I used peanut butter) and honey until smooth. Remove chilled cake balls from the refrigerator before dipping the ends of your sticks into the peanut butter mixture and inserting into the balls. Place into the freezer until the peanut butter mixture sets well. Dip each pop into your nut butter coating, tapping well to remove excess before decorating is desired and allow to set in the refrigerator. 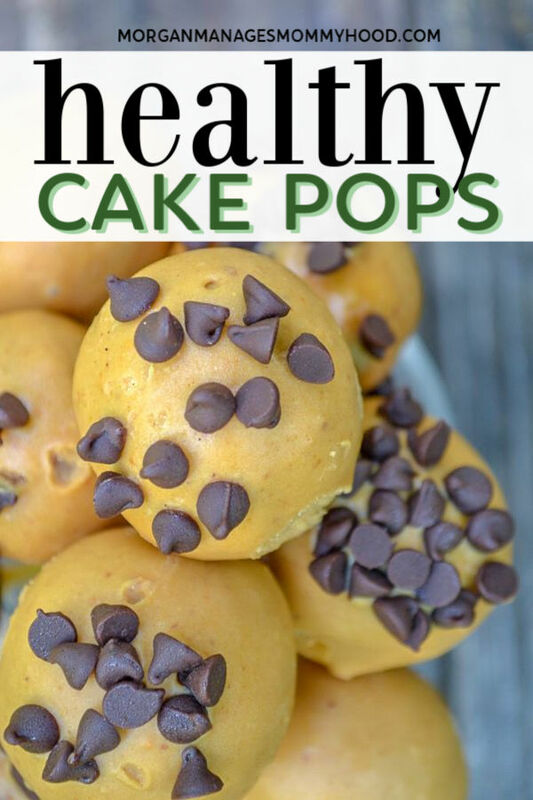 Enjoy your healthy cake pops right from the refrigerator within a week or freeze until ready to enjoy. Okay, so tell me – are your kids addicted to something incredibly inconvenient? (like treats at the coffee shop..) do they dig cake pops? Would they like healthy cake pops? Let me know in the comments! I love this idea! These look so good too, I feel like I would really like them. So creative!